The discovery of antibiotics was a significant advancement in medical sciences. Antibiotics are selective in that they eliminate bacterial infections without harming the patient. If cancer drugs could have the same degree of specificity for their targets, it would save and improve the quality of many lives. Research in this field has experienced variable levels of success, but significant barriers remain. Unlike bacteria, cancer cells are mutated derivatives of cells, so they do not differ significantly from healthy cells in terms of structure and composition. However, cancer cells do have some distinctive characteristics. These features allow for targeted drug delivery, which is the use of a vehicle to deliver nonspecific drugs to only cancer cells. An example of targeted drug delivery that we are interested in are antibody-drug conjugates (ADCs). In recent years, ADCs have been a major topic of interest within the scientific community. Despite extensive research conducted, this therapeutic still has many problems. We came up with a DNA based ADC alternative that solves these problems. We decided to design our system to deliver doxorubicin, a common chemotherapy drug, to acute myeloid leukemia cells. Acute Myeloid Leukemia (AML) is a type of cancer originating from hematopoietic stem cells (HSCs) in the bone marrow. In AML, the common myeloid progenitor rapidly divides and develops into abnormal myeloblasts instead of differentiating and fully maturing. The consequent build up of undifferentiated myeloid blast cells crowds out healthy cells, and results in deficiencies of red blood cells, monocytes, granulocytes, and megakaryocytes. Caused by abnormal Myeloid stem cells. Figure 1: A schematic of the differentiation of hematopoeitic stem cells into components of the circulatory and immume system . Currently, the most common treatment for AML is chemotherapy. This treatment involves injection of cytotoxic drugs into the patient’s bloodstream. The goal is to eliminate all of the cancerous cells while minimizing damage to the healthy cells. However, chemotherapy drugs are not specific to cancerous cells and consequently have side effects that may include fatigue, anemia, nausea, vomiting, and constipation. 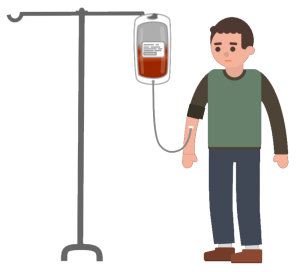 Doxorubicin (DOX) is a chemotherapy drug that is often used to treat AML and many other types of cancer. By intercalating between a cell’s DNA, DOX inhibits the enzyme topoisomerase II, halting DNA replication. It is among the most effective anticancer drugs ever developed. However, when administered directly into the patient’s bloodstream, its off target-effects include congestive heart failure and treatment-related leukemia, as well as the side effects listed above. Antibody-drug conjugates (ADCs) are drug delivery therapeutics that can target chemotherapy drugs like doxorubicin to AML cells. They are composed of three components: a monoclonal antibody, a drug molecule, and a linker that holds the two together. The monoclonal antibody is specific to a receptor on the surface of cancer cells, and is therefore responsible for drug targeting. Binding of the antibody to its respective receptor results in the uptake of the ADC via endocytosis. Once in the cell the linker is degraded, either by enzyme hydrolysis or by pH degradation, to release the drug. The therapeutic range is the difference between the minimum dose of a drug required to be effective and the minimum dose that is toxic. Since ADCs deliver drugs specifically to cancer cells, they have a wider therapeutic range than conventional chemotherapy drugs. This means that more aggressive doses of chemotherapy can be administered to patients, with fewer side effects. In September 2017, the FDA approved Mylotarg or “gemtuzamab ozogamicin“, an ADC for the treatment of AML . 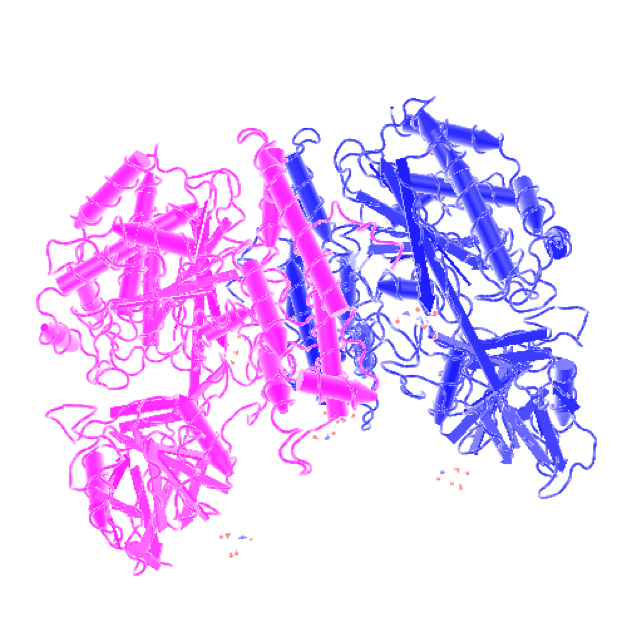 Mylotarg contains: an antibody which targets CD33 (a receptor that is overexpressed on AML cells); the chemotherapy drug, calicheamicin; and an acid linker that is broken down in the lysosome. Older patients especially benefit from Mylotarg because it induces fewer chemotherapy side effects. Currently, Mylotarg is used to treat patients with newly diagnosed CD33-positive AML, patients who are unresponsive to initial treatment, and patients who experience a relapse . The linker’s stability must be sufficiently high to prevent the deconjugation of antibody in serum, but still low enough to allow for drug release after endocytosis. The difference between the pH at which degradation of linkers occurs and the pH of the bloodstream is relatively small, which results in drug instability. As a result, many ADCs produce off-target effects caused by premature release of drugs into the bloodstream. If the linkers were made to be more stable, there is a risk the drug will not be released in the cell at all. In 2010, Mylotarg was removed from the market as a result of elevated drug toxicity. This toxicity was likely a result of the linker instability causing cytotoxic drugs to be released into the bloodstream . Figure 4: Representation of Mylotarg as a typical antibody drug conjugate. 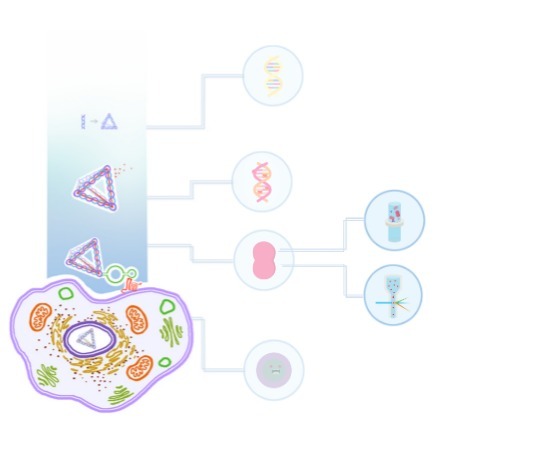 Producing pure ADCs with a low percent of unconjugated antibodies is challenging. 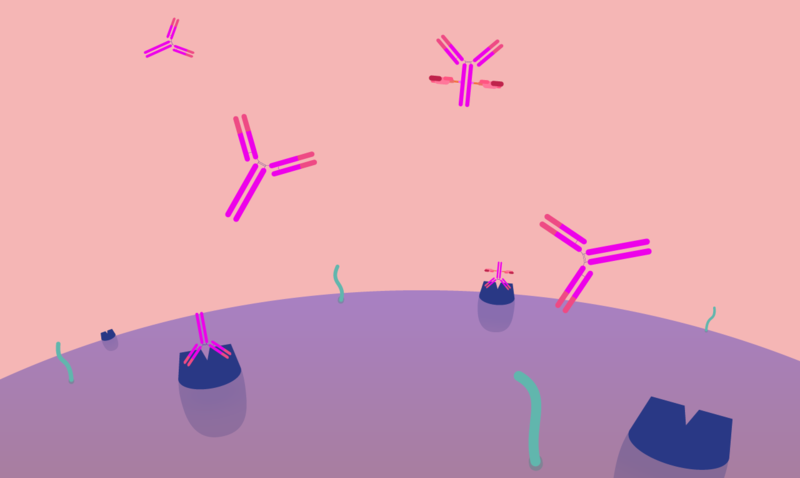 Unconjugated antibodies compete with ADCs for target receptors, which can alter the drug’s effects and therapeutic range. Additionally, unconjugated antibodies can form aggregations and hinder the distribution of ADCs to cancerous cells. A large number of often conflicting criteria must be met in order for a compound to be suitable for use as a cytotoxic agent in an ADC. The compound must have a low susceptibility to multi-drug resistance, a hydrophilic nature, a handle for antibody attachment, and a high potency. 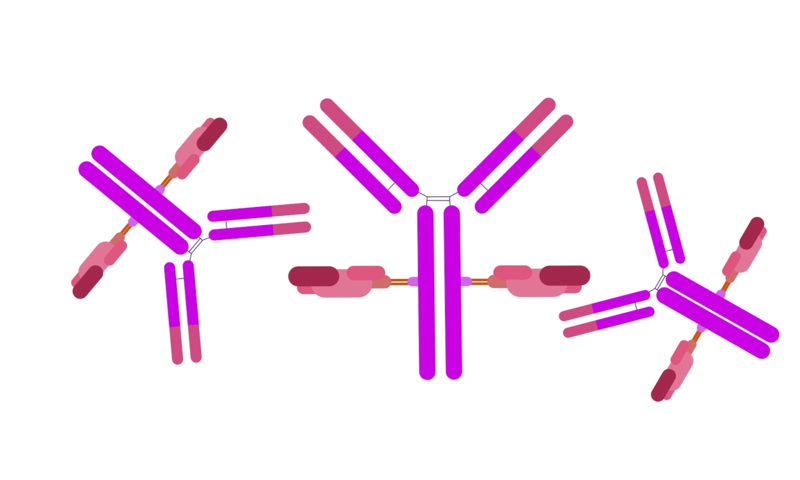 There is a limitation to the number of drug molecules that can be attached to an antibody, typically two to four molecules . Success with common chemotherapy drugs, such as methotrexate, doxorubicin, and vinca alkaloids, in ADCs remains limited . Targeted drug delivery is especially beneficial in treating AML. AML nearly always requires drug treatment, since there are no tumors to surgically remove. Additionally, it is often diagnosed in older patients who cannot tolerate the cytotoxic effects of conventional chemotherapy drugs. Since an ADC had been developed to treat AML, we knew targeting receptors was an effective approach to deliver drugs specifically to AML cells. While Mylotarg is functional, it is also flawed, as evident by its temporary recall. With this in mind, we set out to improve upon ADCs. 1. 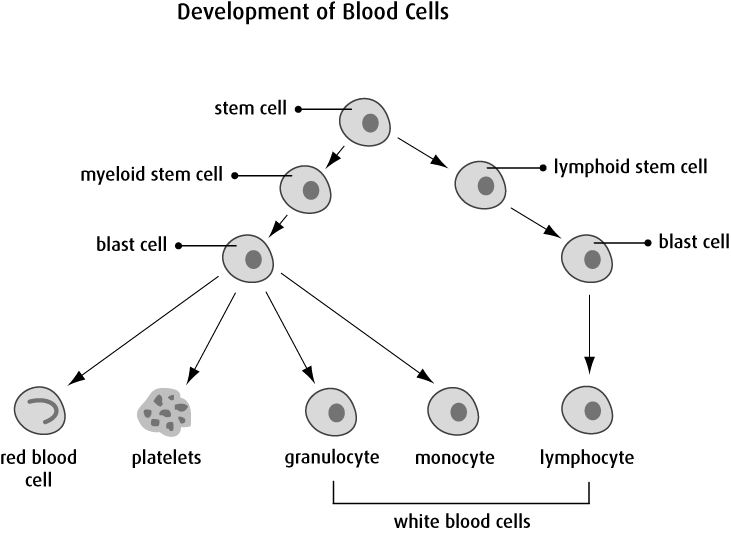 Linkers can be either too stable, and not release drugs in the cell, or not stable enough, and release drugs into the bloodstream. 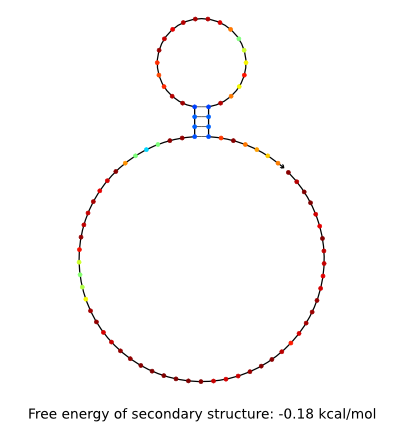 Folded DNA with intercalated DOX has a half-life of roughly 30 hours . This is ample time for the DNA to be taken into the target cells. Once the structure is endocytosed, the drop in pH will destabilize the vehicle and begin to slowly release DOX. 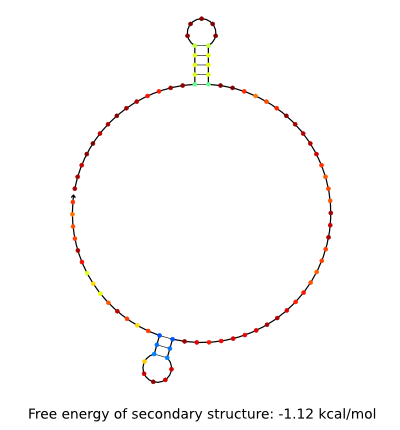 In the cell, the small size of the DNA structures will lead to its accumulation in the nucleus . Our DOX-loaded-DNA will release DOX into the nucleus as it slowly degrades. 2. Conjugation of drugs to antibodies is a chemically complex process that requires a linker. 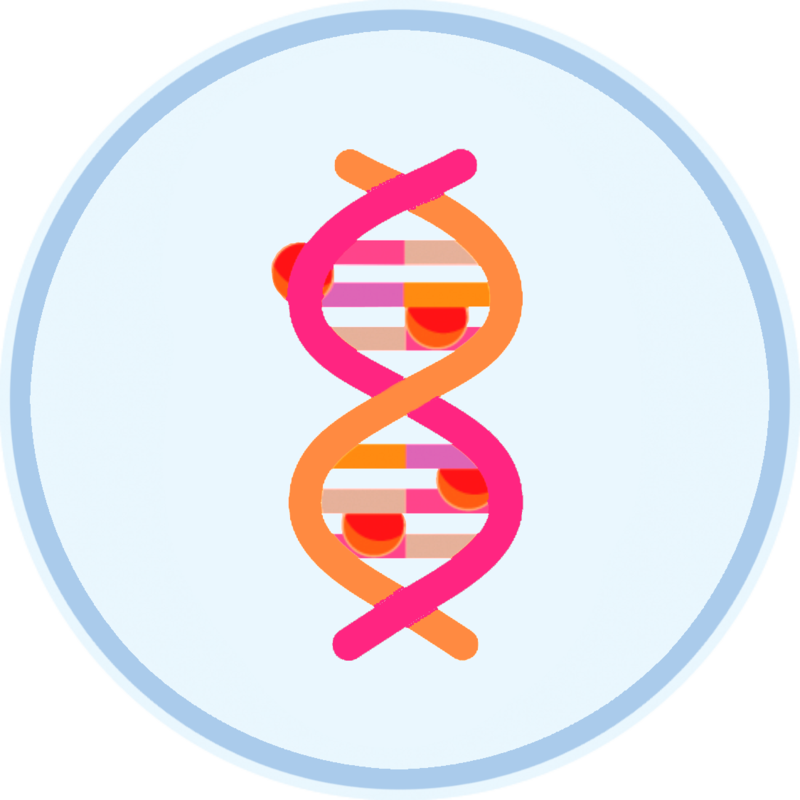 DOX naturally intercalates in DNA, so our structure will be fully loaded after a relatively short incubation period. There is an extremely low chance of this resulting in any empty DNA structures. It is easy to separate the loaded delivery vehicle from any remaining free DOX in the solution. 3. 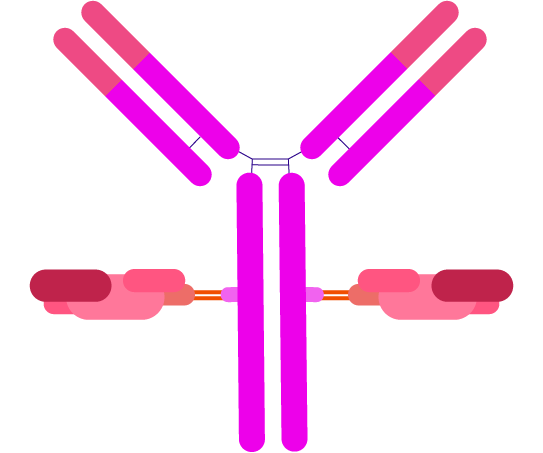 Only 2 – 4 drug molecules can be linked to each antibody, and these drugs must have an attachment handle. Our structure is loaded with the common chemotherapy drug doxorubicin, in much higher quantities than would be possible on an ADC. Rigid, 3D DNA structures are more likely to be taken into the cell by endocytosis than non-rigid, 2D structures . Therefore, our structure had to be rigid and non-flat. Size was also an important consideration; we needed our structure to be small enough to easily pass through nuclear pores, and accumulate in the nucleus. 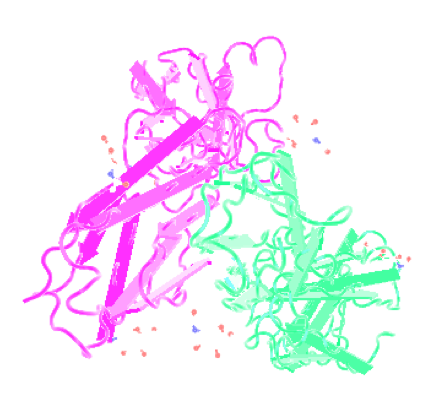 Additionally, our structure had to have binding sites for at least two aptamers. The structure we found that met all of these requirements was a 4 stranded tetrahedron . The tetrahedron is made from 4 unique strands, each folding into a triangular shape. 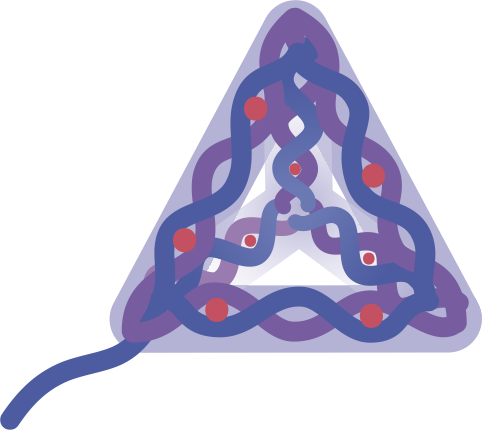 The tetrahedron can be made as a completely double-stranded object, or with an overhang on any of the vertices, to which aptamers can be attached. 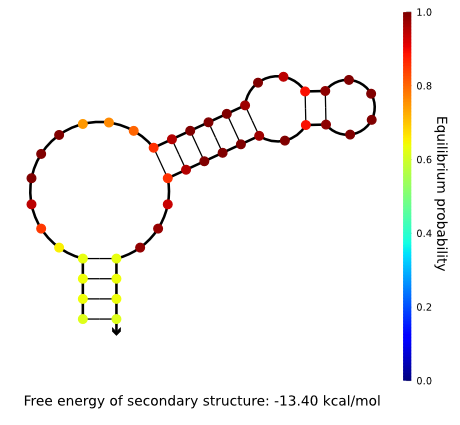 Figure 7: DNA tetrahedron created from 4 DNA strands, with overhang for aptamer attachment. To direct our DNA-DOX structure to AML cells, we decided to use nucleotide aptamers to target the CD33 and CD71 receptors. 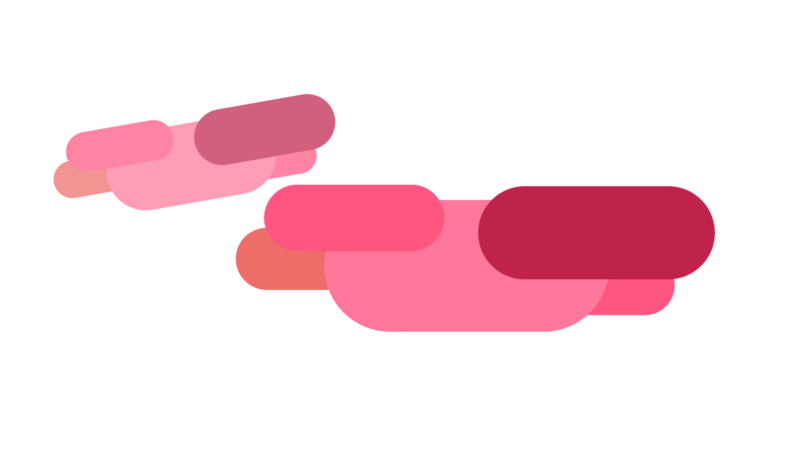 Nucleotide aptamers are short strands of RNA or DNA that have a high affinity and specificity for a target molecule (in this case a protein). Aptamers can be made for any large molecule capable of hydrogen bonding. For proteins, the process for determining an aptamer is called SELEX (Systematic Evolution of Ligands by Exponential Enrichment). SELEX starts with solutions containing many different potential aptamers. 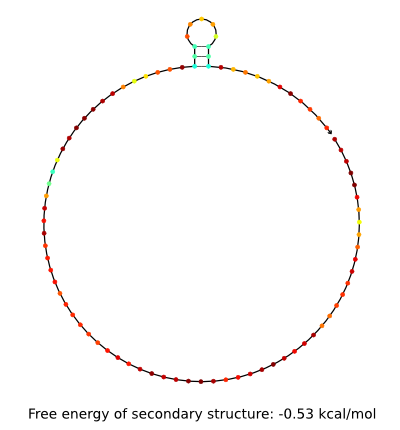 Typically, the solution is run through an affinity column with the target molecule. The potential aptamers that have the highest affinity to the target are separated and amplified with PCR. This is repeated until a satisfactory aptamer has been obtained . We used a RNA aptamer for protein CD71 , and tested 4 DNA aptamers for protein CD33 . 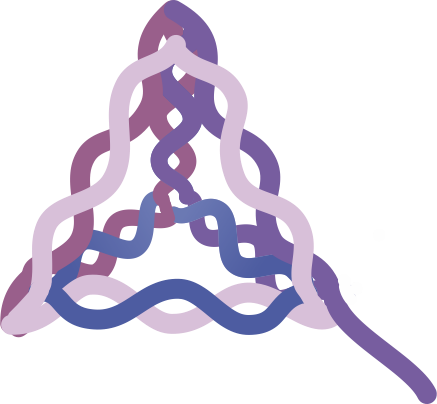 The aptamers were modified by the addition of a sequence at the 5’ end complementary to the overhang, so they could be incorporated into the DNA tetrahedron. 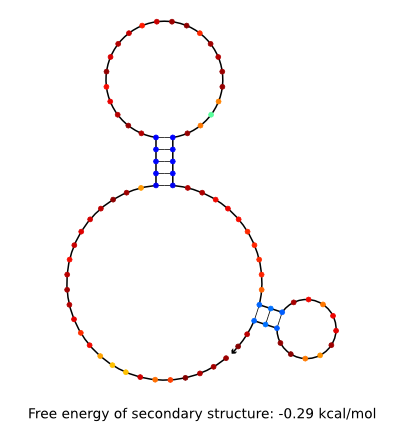 Figure 8 is an image of the RNA aptamer for targeting the CD71 receptor. CD33 is a member of the sialic acid-binding receptor family (siglecs), which is myeloid specific. It is expressed by all myeloid progenitor cells, and at much lower levels compared to AML cells . Figure 10 is an image of the CD33 receptor. CD71 is a transferrin receptor that is frequently expressed in less committed cells. It is expressed in AML cells in 84% of patients . An increase in CD71 expression causes increased cellular concentrations of free iron. This leads to oxidative stress and impairs cell differentiation. CD71 overexpression is linked to severe anemia (low red blood cell levels) and thrombocytopenia (low platelet levels) as a result of myeloid cell differentiation blockage. 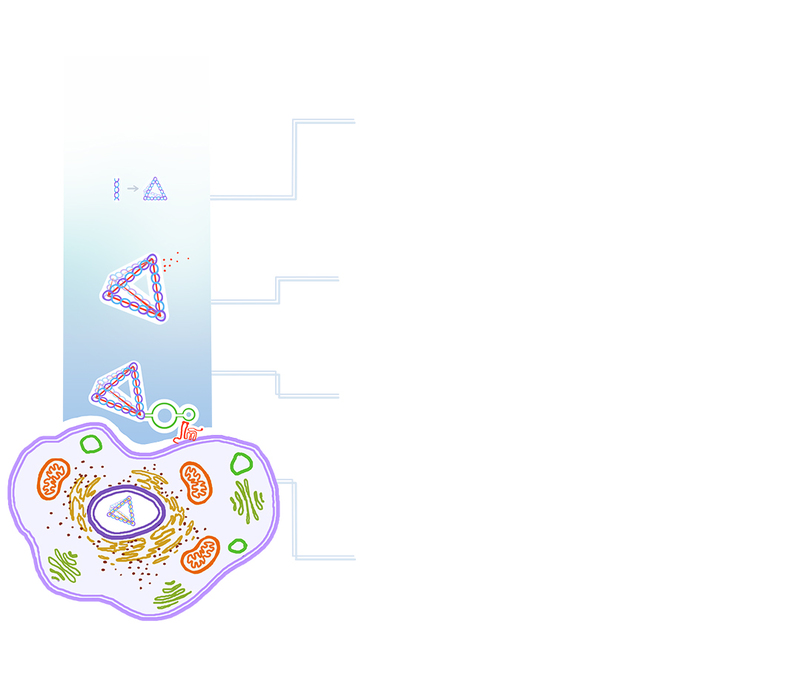 Figure 11 is an image of the CD71 receptor. We chose DOX as the delivery drug because it can be loaded into DNA structures through simple incubation. DOX is fluorescent and is quenched by binding to DNA. The fluorescent properties of DOX allow for the use of a spectrophotometer to measure the amount of DOX that is loaded into the structure. When researching DOX loading into DNA, we found a lack of consensus on the amount of DOX that could be loaded into the tetrahedron. The numbers varied from 26 molecules of DOX , to 330 . To properly develop this system as a therapeutic, we needed to know the amount of drug delivered by the system. 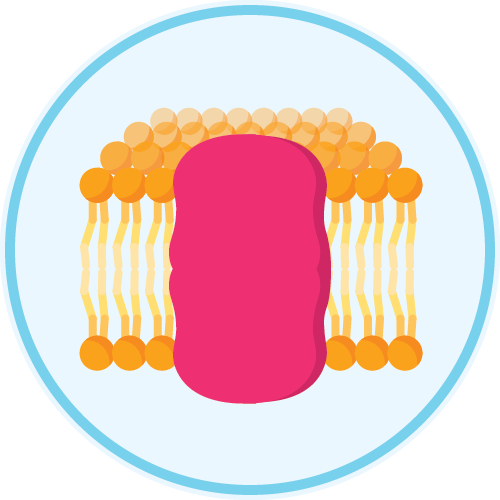 Endocytosis is the process by which eukaryotic cells internalize molecules. This is done by the budding of the cellular membrane to form an endocytic vesicle on the inside of the cell . It plays a role in a variety of cellular functions, including nutrient uptake, regulation of plasma membrane proteins, cell motility, and mitotic facilitation. The CD33 receptor exhibits endocytotic capacities upon activation . This means once our DNA structure binds to the receptor, it will be be uptaken by the cell. We aimed to develop a drug delivery system for AML that improved upon ADCs. Our system had to deliver a higher dose of chemotherapy drugs, have a greater specificity for cancer cells, and induce fewer off-target effects. To complete this project over a 4-month period we had create and stick to a schedule. Tetrahedron assembly and optimization was scheduled to take 2 months. After that, proof of aptamer binding to targeted receptors and loading of DOX could happen simultaneously, and was expected to take 1 month. Finally, proof of delivery of drugs to cells and selective cell death was scheduled for the last month. Click on the diagram to be taken to the the relevant section of the lab book. Acute Myelogenous Leukemia. Canadian Cancer Society. Pfizer Canada Inc.Product monograph. Sollentuna: Orion Pharma; 2005. http://libris.kb.se/resource/bib/10002850. Chondropoulos SD, Delastic A, Spyridonidis A. Targeting AML with anti-CD33 antibodies: Historical walkthrough, clinical impact, future directions. memo. 2013;6(4):271-274. doi: 10.1007/s12254-013-0121-9. Wu B, Shi N, Sun L, Liu L. Clinical value of high expression level of CD71 in acute myeloid leukemia. Neoplasma. 2016;63(5):809. https://www.ncbi.nlm.nih.gov/pubmed/27468886. Madej T, Lanczycki CJ, Zhang D, Thiessen PA, Geer RC, Marchler-Bauer A, Bryant SH. MMDB and VAST+: tracking structural similarities between macromolecular complexes. Nucleic Acids Res. 2014 Jan; 42(Databaseissue):D297-303. Lin J, Guo Y, Wang W. Challenges of antibody drug conjugates in cancer therapy: Current understanding of mechanisms and future strategies. Curr Pharmacol Rep. 2018;4(1):10-26. doi: 10.1007/s40495-018-0122-9. 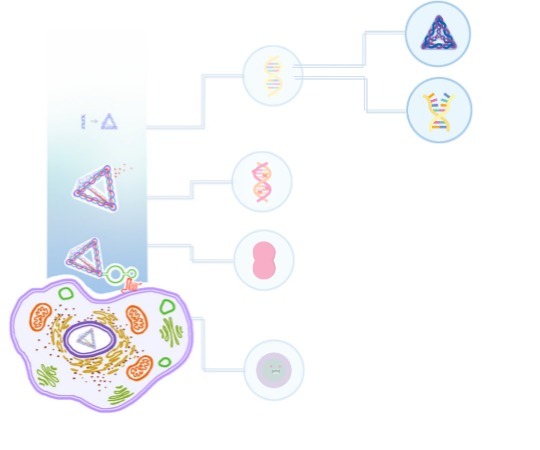 Beck A, Goetsch L, Dumontet C, Corvaïa N. Strategies and challenges for the next generation of antibody-drug conjugates. Nature reviews. Drug discovery. 2017;16(5):315-337. https://www.ncbi.nlm.nih.gov/pubmed/28303026. doi: 10.1038/nrd.2016.268. Definition of milatuzumab doxorubicin antibody drug conjugate NCI drug dictionary. National Cancer Institute. Zeng Y, Liu J, Yang S, Liu W, Xu L, Wang R. Time-lapse live cell imaging to monitor doxorubicin release from DNA origami nanostructures. Journal of materials chemistry. B. 2018;6(11):1605-1612. https://www.ncbi.nlm.nih.gov/pubmed/30221004. doi: 10.1039/C7TB03223D. Lively MO, Salsbury FR, Stuart CH, Gmeiner W. Site-Specific DNA-Doxorubicin Conjugates Display Enhanced Cytotoxicity to Breast Cancer Cells. Bioconjugate Chem.2014;25(1):406-413.https://pubs.acs.org/doi/ipdf/10.1021/bc4005427 doi.org:10.1021/bc4005427. Wang G, Liu J, Chen K, et al. Selection and characterization of DNA aptamer against glucagon receptor by cell-SELEX. Scientificreports. 2017;7(1):7179-10. https://www.ncbi.nlm.nih.gov/pubmed/28775305. doi: 10.1038/s41598-017-05840-w.
Wilner SE, Wengerter B, Maier K, et al. An RNA alternative to human transferrin: A new tool for targeting human cells. MolecularTherapy- NucleicAcids. 2012;1(5):e21. https://www.sciencedirect.com/science/article/pii/S2162253116300798. doi: 10.1038/mtna.2012.14. Zaimy MA, Jebali A, Bazrafshan B, et al. Coinhibition of overexpressed genes in acute myeloid leukemia subtype M2 by gold nanoparticles functionalized with five antisense oligonucleotides and one anti-CD33(+)/CD34(+) aptamer. CancerGeneTherapy. 2016;23(9):315-320.https://www.ncbi.nlm.nih.gov/pubmed/27514505. doi: 10.1038/cgt.2016.33. Sun P, Zhang N, Tang Y, Yang Y, Chu X, Zhao Y. SL2B aptamer and folic acid dual-targeting DNA nanostructures for synergic biological effect with chemotherapy to combat colorectal cancer. International journal of nanomedicine. 2017;12:2657-2672. https://www.ncbi.nlm.nih.gov/pubmed/28435250. doi: 10.2147/IJN.S132929. 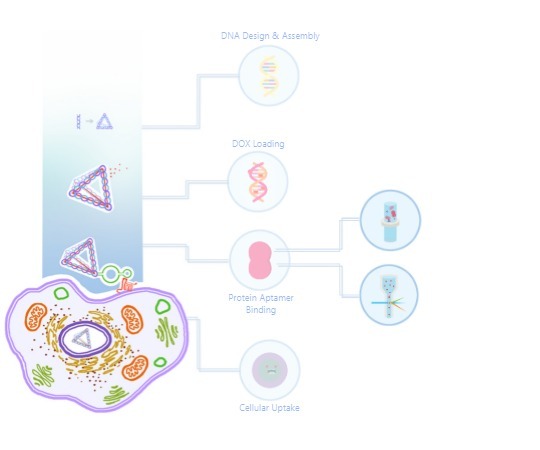 Kim KR, Kim DR, Lee T, Yhee JY, Kim BS, Kwona IC, Ahn DR. Drug delivery by a self-assembled DNA tetrahedron for overcoming drug resistance in breast cancer cells. Chemical communications. 2011;49(1):2010-2012. https://www.ncbi.nlm.nih.gov/pubmed/22105188. doi: 10.1039/c1cc90182f.